This week the A&E channel highlights Atlanta in a series of Intervention episodes focused on the “Heroin Triangle.” Intervention documents individuals addicted to drugs and alcohol. “The Heroin Triangle” consists of areas just outside of Atlanta, mainly in Cobb County. Cobb County officials report a growing opioid and heroin epidemic. Examples of opioids are morphine, hydromorphone, methadone, fentanyl, hydrocodone, codeine, tramadol and burprenorphine. Heroin is an opioid drug made from morphine. Research indicates that 80% of Americans using heroin first misused prescription opioids. The National Institute of Drug Abuse reports over 30,000 deaths last year from opioid overdose. There were 20,000 overdose deaths from heroin and illicit opioids. Drug overdose deaths in 2016 totaled approximately 64,000 people, making it the leading cause of death of individuals under 60 – exceeding car accidents. Opioid death rates are highest for white males. What is the cause of this opioid epidemic? 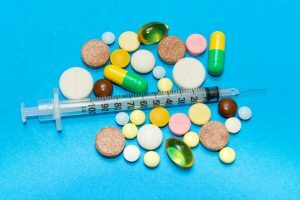 The New England Journal of Medicine (“TNEJM”) reports that the “widespread use of opioid analgesics has resulted in a national epidemic of opioid overdose deaths and addictions.” Opioid analgesics are the most commonly prescribed class of medications. Thirty percent of adults and forty percent of older adults suffer from chronic pain. However, research suggests that opioids soon become the problem. As TNEJM explains: For a patient in chronic pain, even mild levels of pain can trigger the learned associations between pain and drug relief, which are manifested as an urge for relief. Such a conditioned urge for relief from even mild pain can lead to the early inappropriate use of an opioid outside of prescribed scheduling. Given the current overdose and addiction epidemic, doctors and medical associations are starting to question the practice of prescribing opioids for chronic pain. The Center for Disease Control reports that over 2 million Americans are estimated to be dependent on opioids and an additional 95 million are dependent on prescription painkillers. Kaiser Permanente has developed a new program that treats both pain and addiction as an integrated program. Patients meet with a doctor, a pharmacist, mental health therapists, physical therapists and a nurse. By dealing with both pain and addiction, Kaiser’s program reports a reduction of ER visits by 25 percent. Inpatient admissions for opioid use dropped by 40 percent. Patients learn alternatives therapies such as meditation, exercise, acupuncture and mindfulness. As Kaiser experts explain: the future of healthcare is integrated. Many people with disabilities regularly treat with pain management. A renewed national focus on dealing with pain and helping individuals who live with chronic pain is a welcome sight. As always, the Kaiser Foundation is frequently front and center in the national healthcare discussion. More on the opioid crisis in Georgia specifically tomorrow. Tagged: "opioid addiction" "heroin epidemic"